Quick Take: Leesa and Purple are two well-known mattress brands. How do you know which one is going to be best suited for your lifestyle? If you’ve read some reviews and still can’t decide, this Leesa vs Purple mattress comparison might help. You’ll get to learn more about both brands, which will help separate the two, so you can make a choice. This Leesa Purple mattress comparison includes everything from price to firmness to give you the clearest idea on these mattresses. Check out our full reviews for Leesa and Purple to learn even more! It’s likely that on your quest to buy a new mattress, this Leesa vs Purple mattress comparison was not your first stop. You probably know individual details about both brands but having them placed side-by-side for you to figure things out may be helpful. You’ll find out what these beds are made of, what special features they have, how much they cost, and what other perks you receive once you own one. One of the things that draws people towards Leesa is often their charitable nature. Leesa donates one mattress for every ten mattresses sold. These donated mattresses go to homeless shelters and/or people in need. As of this Leesa vs Purple mattress comparison, thousands of mattresses have been donated! Beyond their ability to do good, you’re going to need the mattress to be stable, comfortable, and dependable. This comparison will allow you to objectively look at Purple and Leesa so you know all you need to know about both mattresses. Leesa mattresses are made with three layers of foam. The first layer of a Leesa mattress is 2” Avena foam. Avena is a patented latex foam that is durable and offers a nice bounce. This is followed up by 2” of memory foam. Memory foam offers great pressure relief and support. The final layer is 6” of high density support foam. While memory foam can be problematic in some ways, the inclusion of the Avena foam adds cooling and breathability. When it comes to Purple, things being with 2” of Hyper-Elastic Polymer. This layer is unique as it comes in a Smart Comfort grid design. The second layer is a 3.5” layer of dense poly foam. Finally, there’s 4” of dense poly foam. This last layer is the base of the mattress and is responsible for the durability and support that the other layers require. The top two layers are the layers that responsible for pain and pressure relief, which improves the way people sleep. Both Leesa and Purple are suitable to a variety of sleepers. So, no need to worry about your position because both of these mattresses will work if you’re a side sleeper, a back sleeper, or you sleep in all different kinds of positions. Medium-firm best describes Purple. If a number had to be picked, most would describe it as a 6 out of 10. This means that while firm, there is still going to be some give and the mattress will still cradle you in all the right ways. At the end of the day, Purple is just slightly firmer than Leesa, but neither mattress is extremely firm or soft. If you want something that is firmer or softer than your average medium-firm mattress, these mattresses might not work for you. While Purple is a 6 out of 10, Leesa would be just slightly softer at 5.5. Leesa is not the firmest mattress, but it’s not too soft. You can sleep in a variety of positions and your mattress will cradle you while remaining supportive. This mattress is a great choice if you want something on the softer end that still has enough firmness to stop you from sinking into the bed. You won’t find a problem with Purple where motion transfer is the topic. The multiple foam layers will isolate any full body movements that you’d normally feel on an innerspring mattress. The majority of motion is removed thanks to the top foam layer and the remaining layers handle the rest, so that you don’t feel a thing! Leesa is also pretty good at handling motion transfer, as well. The process is the same, with the foam trapping the motion energy and isolating it so you don’t have to feel it. This makes the Leesa or Purple a great option for couples because in either case you won’t have to worry about unnecessary bed movements bothering the one you’re sleeping with. Leesa has been in the online mattress world for quite a while. The great thing about them is that they give back to the communities that need help the most. For every 10 mattresses that are sold, one is donated to homeless shelters or other needy individuals. If your mattress is returned and can be spared it is also donated to someone in need. When you put it into perspective like that and look at the fact that you can get a high-end mattress for under $1,100, there isn’t much to complain about! Purple has similar prices, though they are just slightly more expensive than Leesa. While Leesa runs you $1,100 for a California King (the largest mattress they offer), it will cost you $1,299 with Purple. Beyond pricing, the only real difference here is that Purple’s smallest mattress is the Twin XL. If you want a Twin bed, Purple does not carry one. A 10-year warranty and 100-night trial are available! Leesa wants you to be happy with your purchase. The easiest way to make sure this happens is to allow you a chance to get your money back if you’re unsatisfied. This happens with the 100-night risk free trial. You get 100 nights to sleep on a Leesa mattress. If, in that time, you realize it isn’t the right fit, you can get your money back and return the mattress. Most tend to keep the mattress and those people are protected with a 10-year warranty. Purple has the same deal going on. If you’re not happy with your mattress, you just need to let Purple know. If nothing can be done, they will take back the mattress and you’ll get your money back. You have 100-nights to make your decision. It couldn’t be easier or more hassle-free. As a Purple sleeper, you’ll also have access to a 10-year warranty that protects you against defects or flaws. 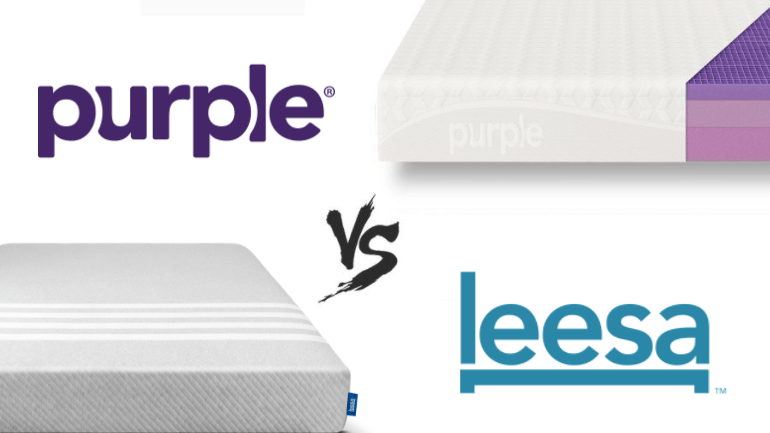 Leesa and Purple are both great brands with worthwhile mattresses. The reality is that most people remain incredibly happy with either mattress when they take the plunge and buy one. With that in mind, it’s ultimately going to depend on how much you want to spend and/or how firm or soft you want your mattress.